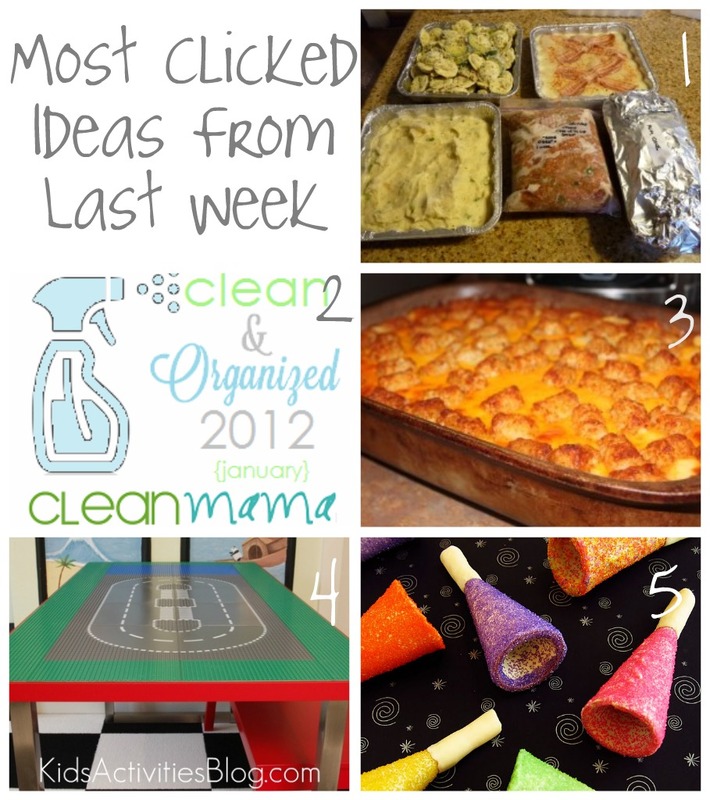 You guys impress me each week with all of the mom ideas you linkup and share. If you missed the 100+ solutions and resources that were shared last week, here is a recap of the most viewed. The Jammie Girl shared her five favorite freezer meals. This post is perfect for this time of year as we all work hard to get dinner on the table and eat dinner at home. Clean Mama is helping us get organized and clean in 2012. She has some free printables for you! Kids Activities Blog shares a few recipes perfect for this time of year. One of them is for Tater Tot Casserole. My kids love this stuff. Kids Activities Blog also showed us step by step how to build a Lego table. We really, really need one of these at our house. My kids would kiss the ground I walk on. Hungry Happenings shares a tutorial for making edible party horns. Guess what these are made out of. Just guess. Don’t forget to check out Milk and Cuddles favorite three picks from last week as well. Don’t forget to check out all of the awesome meal planning tips that other bloggers are sharing on Crystal & Co., right now. Peruse them for solutions to help make feeding your family simple. And, if you are struggling with meal planning, enter my Recipe Organizer giveaway from Cook’n. It sells for $99.95 and one of my lucky readers will win a download for themselves. This program comes with recipes, allows you to merge and store recipes from any website and links up to your mobile device. You can create grocery lists and meal plans using this program as well. Totally a no brainer. Follow our #dinnerideas conversations over on Twitter as well with Crystal & Co., and 3 Boys and a Dog! Now, let’s linkup! What are you going to share this week? I shared my Slow Roasted Chicken and 8 Reasons to Add Fermented Foods to Your Diet. Also the top 10 posts of the year at RFF and a post about new year resolutions and 8 actions to take. Join me in my Fermentation Challenge starting January 9 at Real Food Forager! I love the Lego Table! It’s on my list for later this year as I get the house decluttered, yet again. This week I shared lessons I learned from a home business that failed last year. I also shared my themes for 2012 as part of my Annual Review. I’m so excited to have been one of the most viewed links last week! That gives me the motivation I need to do MORE freezer cooking (since I gave all that stuff away as gifts)! This week I posted my favorite recipes for homemade cough and cold remedies, including a non-toxic “vapor rub” and a super-secret, super-effective way to use it. Happy new year! Lots of wonderful ideas. I think my favorite is number 63 and that yummy looking dessert. I can see your family eating all of that!! Yummo! !